​Henrico Roofing, we repair or replace slate roofs on any type of home, church, and office roofs for the Henrico, VA area and beyond including Chesterfield, Powhatan, Mechanicsville, Petersburg and more. We have served clients in Henrico and beyond for 3 generations proving commitment to community, hard work, and ethical business practices. ​Slate is a fine grade rock that is mostly grey in color, but if it has more iron or organic material in it can occur in shades of green, red, black, purple, and brown. Over thousands or millions of years a field of Clay or mud is compressed into slate by the pressure and heat produced by tectonic forces (movement of the earth’s crust). ​Slate performs well as roofing because it can be cut into thin sheets, it is moisture repellent, and withstands freezing and thawing. 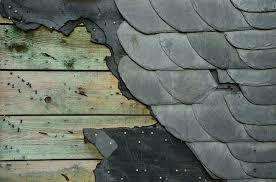 It has been used as roofing since the 13th century, and can easily last 175 years or more. However, it is very expensive a 1500 square foot roof, depending on type of slate, will cost 20,000 to 1000,000 for installation. It is easily 5 or 7 times as expensive as asphalt shingles. Some people are willing to pay the high price to get a roof whose look is naturally kinda rough yet stunning at the same time. Slate tiles that are walked on may break apart immediately or 5 to 10 years later causing water intrusion. Thus, roof scaffolding must be used during roof repairs or installations which increases labor costs. The roof must be structured to handle the heavy weight (800 to 15,00 lbs. per 100 square feet) or roof collapse could happen at any time. 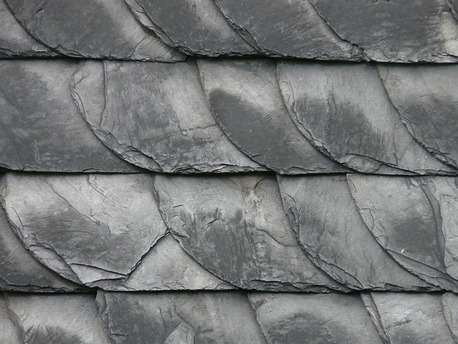 Slate roofs tiles are heavy, they vary in thickness so a roofer may be searching out the right tile, and can shed layers during the installation process- all of these characteristics make for a longer install time. Synthetics plastic tiles, without fiber reinforcement, were designed to look like cedar and slate with promises of maintenance free roof protection over a lifetime. These plastic shingles are lightweight and easy to install, but are also extremely thin possessing a shiny finish which keeps them from looking anything like a cedar shake or slate tile. Plus, they have a major problem with durability during winter weather- Polypropylene is a fragile material prone to cracking when cold which makes them unsuitable in cold climates. ​Composite shake, shingle and slate tiles are made from recycled materials and a mineral filer such as ground up limestone then mixed with proprietary plastic resins and colors. The do give the same look when viewed from the ground as cedar shakes or slate tiles, and have a long maintenance free lifespan of about 50 years. They are also very expensive, about 4 times the cost of asphalt shingles which does put them out of some clients’ price range. ​Henrico Roofing has only experienced, licensed and insured employees working on your roof. We only use high quality time tested roofing materials. 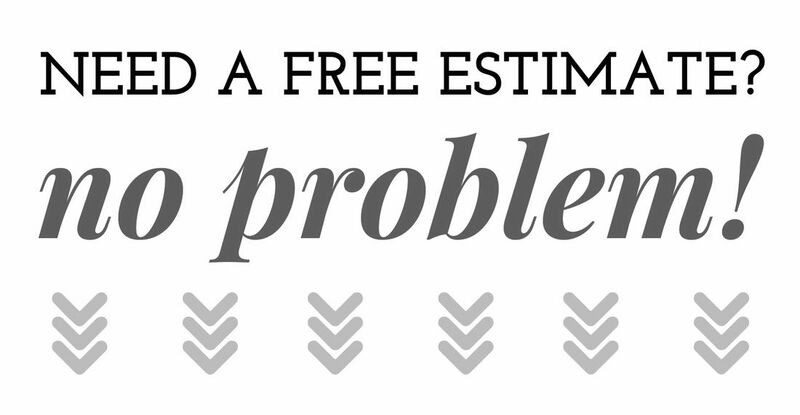 Please call (804) 894-9139 for a free, no commitments roofing consultation with estimates for any roofing concerns.